We Are Your Friendly Local Insurance Office- How Can We Help You Today? We also offer Auto Registration service and Tax Preparation & Filing Service here in our office. 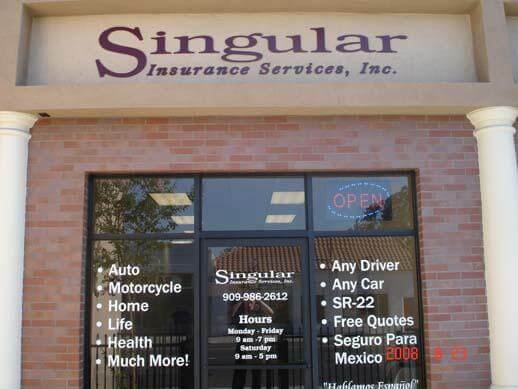 Singular Insurance Services is a family owned and operated business with years of experience proudly providing insurance services to clients in Ontario CA and the surrounding areas. Many of our clients will often refer to us as the best insurance broker in the Inland Empire! With hundreds of insurance carriers to choose from, when you contact us for a quote we will be able to shop your insurance needs with the best of the best, and be sure to find you the absolute lowest rates. Since our broker fees are the lowest around, you can be sure you have found the most competitive insurance rates possible. We are fully licensed with the CA Department of Insurance, bonded and insured, and are committed to fair and ethical business practices. For fast insurance quotes and coverage for personal or commercial needs, same-day auto registration without long lines, and expert income tax preparation and filing to get a fast return, give Singular Insurance Services a call today at (909) 986-2612 or contact us online to request a quote! Have Questions? Get a Quote Today! Copyright 2019, Singular Insurance Services, Inc.